'I've been given a new lease of life and I hope my story is inspiring to others' - read Eve's journey from severe rheumatoid arthritis to becoming a professional songwriter. You clearly know your craft. I'll probably be singing that for the next couple of days. Naming Eve as One to Watch, NSAI describes what it takes to be be accorded this accolade. These writers are being recognized by our evaluators as writers who are on the rise! These members have gotten the attention of our evaluators for their unique and promising writing skills. Keep an eye on these folks… they just keep getting better! Living in the town of Bangor, County Down in Northern Ireland has informed and influenced the creative output of this very talented singer-songwriter. Having battled the early-life afflictions of both Rheumatoid Arthritis and Type 1 Diabetes, the desire to endure and succeed has been a driving force against the challenges placed before Eve Williams. Recognised by the Nashville Songwriters Association International as a talent to watch and a member of the prestigious Irish Songwriters Guild, she has not let her difficulties stand in the way of achieving a Master of Music in Songwriting from Bath Spa University. Her first recording, What, Now?was released in 2008 and was followed by Twenty Miles From Home in 2012. Now we are presented with Peregreni (a Latin word for ‘wanderers’). The nine songs included here are all beautifully performed and laced with melody and gentle mood. Steven McKnight, one of Northern Ireland's best known guitarists, is joined by James Scott on guitar, bass; Darren Matthews on keys with Eve singing and playing keys also. Her voice is warm and strong and these songs are informed by optimistic messages of rising above the daily life constraints that we all face – titles such as Don’t Anchor Me and Eagle’s Wings suggest as much and the message of Who Needs a Knight goes straight to the belief in oneself and the ability to live independently. The past is visited in songs like Vale of Angels and Illumination speaks of the inspiration of seeing a brighter tomorrow. This is an excellent folk music and comes highly recommended. I am happy to play Eve's wonderful songs. She's a very talented writer. Eve Williams can glide between power ballads and Celtic folk with remarkable ease. Peregreni is a delightful album that showcases her songwriting genius and impeccable power of interpretation.... Eve Williams has this lighthouse effect that will continue to attract travellers from all walks of life. There are songs with hooks such as “Illumination” and others that are touching such as “Vale Of Angels” where Eve sings of days with her grandmother and “Ailsa Craig” a love song that name checks the small island of that name off the coast of Scotland.... This is quality stuff... a talented artist. This 5-track EP is a testament to her continuous growth as an artist as well as an observer of humankind. 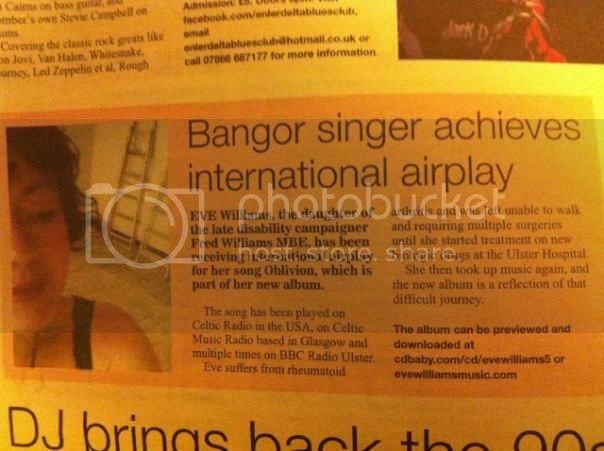 Twenty Miles from Home debuts from Northern Ireland through singer/songwriter and vocalist par excellence Eve Williams. She piqued my interest after I heard the song Oblivion. It’s a kind of song that’s hard to ignore due to its unique style. The subject of her voice is one of the things that’s covered here. What gave way to her singing that’s full-bodied and expressive? You will learn more as you read this interview. An in- depth interview with Eve about lightning, toast and the ladies of Clannad available here. Eve Williams has a kind of sound that will appeal to the wider public. I think people who listen to ambient and indie folk will love her music.Those who are also into fine songwriting with classical flavour will certainly buy her recordings. The mesmerizing melodies of her songs are centered around her classically trained vocals. On top of this, her poetic lyrics will enchant you with their mystery and romantic flourishes. Twenty Miles From Home is her album that’s released late last year. Her carrier single Oblivion (Co-written by Scottish artist Archie Atholl)is approaching 1000 plays via soundcloud and rising. The atmosphere of Twenty Miles From Home calls to mind bellowing curtains and the mysterious beauty of Northern Ireland where this singer/songwriter resides. When I read about her influences, I am pleased: Kate Bush, Sarah Brightman, Enya, Maire Brennan, Peggy Lee, Dusty Springfield, Tennyson, Shakespeare and T.H.White. Think of the soft approach of Cara Dillon and the vocal power of Evanescence.....Her voice is superb and full bodied. She is also a writer which explains her interesting lyrics and refernces to classical literature. Twenty Miles from Home strikes me as a balance of emotion and control....The whole album shimmers... Twenty Miles from Home is a beautiful album. Oblivion is one track with full arrangements and soaring vocals along with Tall Dark Stranger. These are orchestrated tracks. But I love the contrast of the spare arrangement on others like Broken Dolls (feat Scarlett Burnside), The Rock (feat. Dominik Boncza-Skrzynecki) and many more. Eve Williams is based in County Down, Northern Ireland. It is probably the beautiful landscapes that shaped her sound and sentiments. It it an album that can appeal to lovers of Sinead O’Connor, Cara Dillon and Evanescence. The combination of folk simplicity and operatic flourishes in her songs makes her one of the rising voices in the Irish music scene. Auto-tune? She don't got it. Eve Williams is a masterful artist that sets herself apart from today's mainstream sound and returns you to a time when talent and skill were key. Classical lines, heartfelt vocals, and a strong flavor of the traditional Celtic sound blend together to form a rare and precious art that is so uncommon in the modern music market. With songs of triumph, reflection and even pain, Eve draws you into her personal experience in a way that few singers can. With one part Kate Bush, one part Amy Lee, and a whole lot of original Eve, this entire album will delight true music lovers and is likely to bring a few teeny boppers into the fold as well. No pretense, no needless effects and frills - Eve is a true artist like few living today. I highly recommend Oblivion, which has rapidly become a new personal favorite. The Rock is powerful and upbeat, a song for morning sun and hot, steaming coffee. Tall Dark Stranger and Broken Dolls carry an eerie quality that cuts to the soul. Every track is an experience all its own, and you'll find yourself returning to this work again and again, staring out into space as Eve takes you into her world and shares her soul with a brevity fit for Joan of Arc. Eve has been a joy to work with. She is a superbly accomplished songwriter and vocalist with a completely professional approach to music. Eve works fast, works hard, and keeps in constant contact with the other professionals she works with. We were able to put together some top-quality material in very quick time, and I am looking forward to working with her on future projects. It’s a coincidence! I was watching Skyfall and nearly cried when M played by Judi Dench starts reciting the lines by Lord Tennyson. Now we have Oblivion which is a song also inspired by the poetry of Tennyson himself. The heartbreaking theme resonates and given more weight with Eve’s excellent vocal delivery. She has a terrific operatic range. The orchestration in this track is simply superb. Oblivion could very well be one of those “ soundtrack of your life” that you take with you as you greet the chill of the coming winter. With her supple Mezzo-soprano, Eve Williams can glide between power ballads and Celtic folk with remarkable ease. Peregrini is a delightful album that showcases her songwriting genius and impeccable power of interpretation. Great songs from a different voice. I like how Eve explains the history of every song. She doesn’t sound nervous and I sometimes joke to her that she would make a good music teacher. I am glad she carries every tune with minimal effort (considering the amount of people who are there)! Twenty Miles from Home is tonally ethereal and the instrumentation works really well when simplistic and pared down. I can imagine that Eve Williams casts an atmospheric spell over live audiences with gentle yet other-worldly melodies and a wonderful rise and fall in the vocal range. Click below for Celtic Music Fan's song recommendation of Miranda, written by Eve, Andrew Price and Stuart Revnell. Her art stands up by itself. Her Celtic roots shine through her ballads, drawing comparisons with many well-loved artists including Enya, Kate Bush, Sarah Brightman and similar. We are really proud to have Eve perform. She is very talented. Eve Williams is a name you will be hearing alot from this year. Eve Williams at the Pavilion a review by Estrella Ojos submitted on 24/10/2006 The Pavilion Bar in Belfast has a good vibe: its high ceilings, mood lighting, and a stage set back under a low ceiling, all lend themselves to a terrific atmosphere for live music. Especially on Sunday 15th October, when there was a quiet buzz about the place as Eve Williams took the stage. Accompanied by two guitarists and a bassist, Eve’s ever-graceful voice easily moved between the notes of her songs. Her acoustic rendition of ‘Chain of Fools’ brought out a more soul-ish side to her voice whilst her own songs, such as ‘Homesick’ allowed her to communicate more tender emotions. At times it seemed she may have been holding back; nonetheless, I still had her tunes in my head a day or two later. Having seen her perform on other occasions, this was her best performance yet. I look forward to hearing more of her repertoire in future. Eve Williams is a singer that brings both poetry and a sense of drama to her music, she has a powerful voice, one that she uses to project the words well.... "Twenty Miles From Home" brings elements of classical music into a song format. It's an album that is highly dramatic, it does bring images of grand pianos in the sea and the middle of forests, the lyrics have a sense of mystery about them.